Oh Real Food Festival - why have you forsaken me? Last year, I had the nicest time ever and I was looking forward to this year so much I even bought an industrial-sized cooler to take with me. 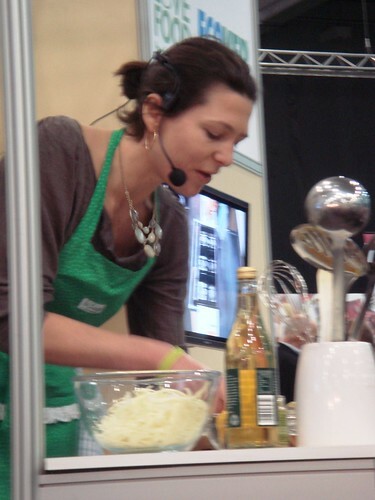 But alas, 2009's Real Food Festival was a decidedly mixed bag. Lots of tasty free samples. Producers from all across the land. Added cute animals = constant wafting poo smells. Not enough souvenir cotton bags - every visitor was meant to get one, but they ran out only 30 minutes into the 2nd day of a three day festival! 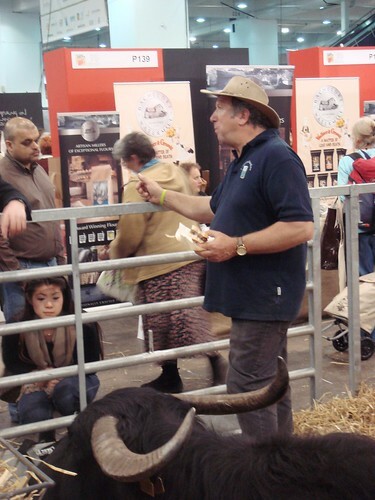 Nightmare stall arrangements, like going into a supermarket and finding cheese on the same shelf as chocolate, chicken side-by-side with coffee - an irritating ploy to force us to buy the glossy show guides for £5 each. Last year everything was grouped by category, which meant you could locate, browse and compare products easily. I was hoping to visit Nutty Tarts again to get some of their gorgeous Millionaire's Shortbread, but I was damned if I was going to shell out another £5 to track them down in the melee. 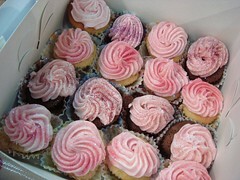 Too many cupcakes! 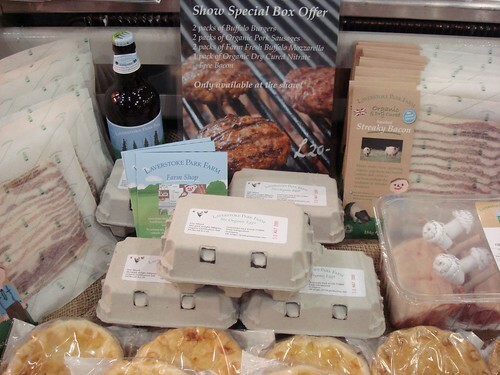 Previously there'd been a wider range of producers - lots of fresh fruit and veg like Fundamentally Fungus, farmyard produce (I'd regretted not buying some gulls' eggs last year), and most importantly seafood purveyors. 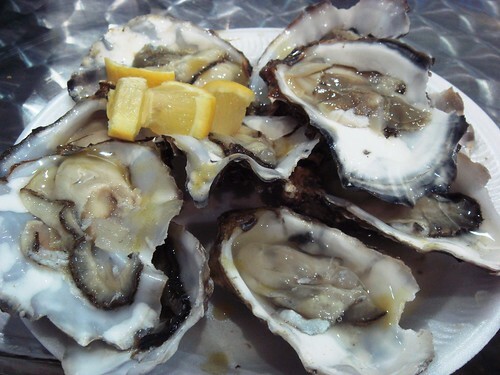 I'd gorged myself on raw oysters and clams from about four different stands including Wright Brothers and Richard Hayward of Company Shed, Mersea fame - this year all I could find was Rossmore Oysters. Not a lot of atmosphere for some reason - it all felt a little too slick and corporate. Rossmore Oysters' attempt to rip me off. They had medium Portsmouth and Jersey oysters for £1 each, £10 for a dozen - I ordered a dozen and they palmed me off with ten. I didn't notice till I sat down, and made poor hubby go back and demand the other two. They then claimed that I'd only asked for ten in the first place! Grrrrrrrrrr. No-one gets between me and my oysters. NO maps on display - I constantly lost my bearings and couldn't return to eg Pyman Pâtés like I meant to. You know something's wrong when you'd rather be in Bluewater. Image theft! In the run-up they'd sent out an email newsletter advertising this year's Festival and they'd actually stolen one of my photos off Flickr to illustrate the piece. 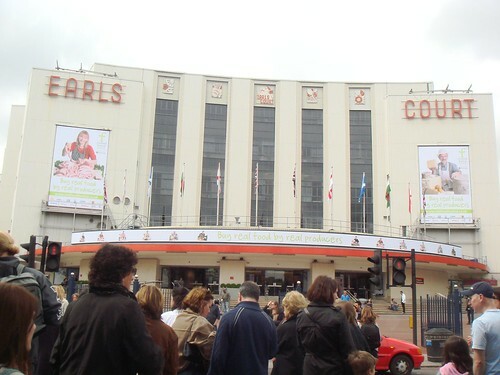 Earls Court was the venue for over 400 producers to show their wares at "the UK's most exciting food event". Hubby and I met up with our mate Louise from knit one bake too to wander around. As mentioned before, orientation was kinda difficult but we did find some gems. Gaby's Hot Stuff was run by two engaging guys who were definitely the best dressed that day and Gaby herself smouldered in the background as we tried her Original and Loco Chilli Lime sauces with tortilla chips. 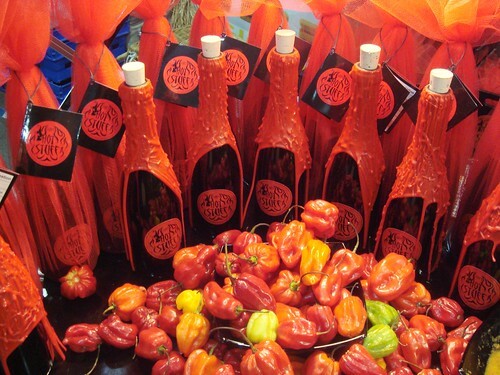 I bought a bottle of the Lime - the most I've ever spent on a chilli sauce (£12!) - but it was a generous, hefty size and they did charm my socks off. From Rookbeare Farm we treated ourselves to special sorbets in Lime Daquiri and Peach Bellini flavours. These were exclusive to the Real Food Festival and were deliciously zingy and delightfully boozy (also quite rude-looking if you see Lou's picture below). 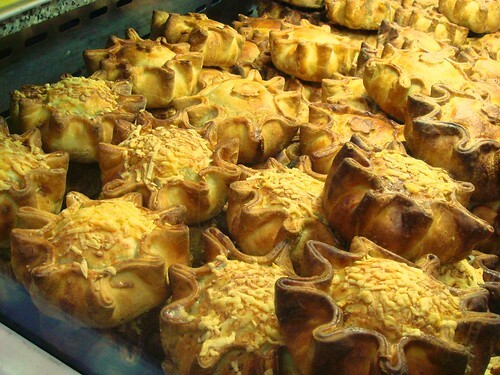 Rookbeare - please roll these out for general consumption now! 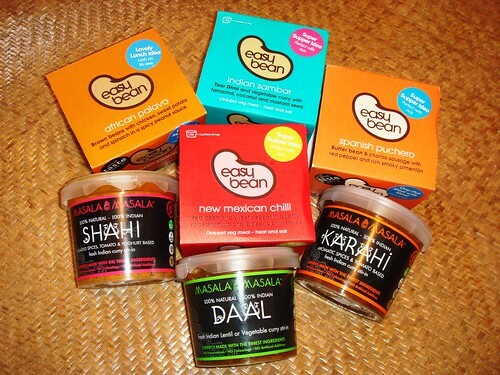 Easy Bean offered tubs of one-pot bean based meals - intensely savoury with generous chunks of veg. I bought their New Mexican Chilli, Indian Sambar, Spanish Puchero and African Palava and got a rather nice cotton bag to carry them in. 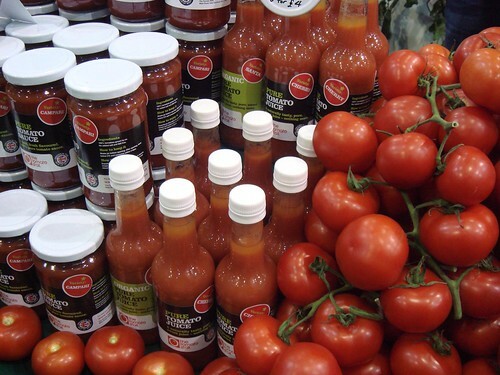 The pithily-named Tomato Stall had a wide range of heritage tomatoes for sale, as well as juices and preserves. They also had the best thing I tasted that day - their own oak-roasted tomatoes. It sounded a bit manky, but it turned out to be gloriously smokey and sweet - I promptly bought a big tub to eat on its own. 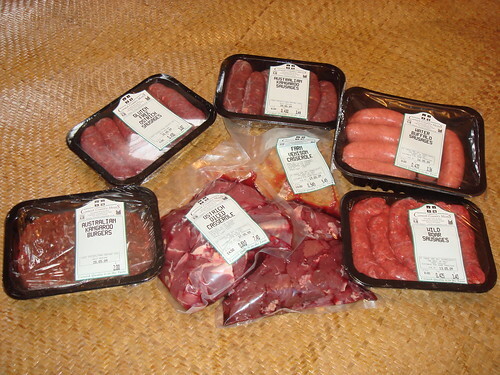 Cornwall Country meats were, weirdly, exotic meat purveyors - I stuffed my coolbag with kangaroo, ostrich, wild boar, buffalo and venison burgers and sausages. All their meat products contain 100% of the meat on the label - none of this 10% kangaroo, 90% pork malarkey. 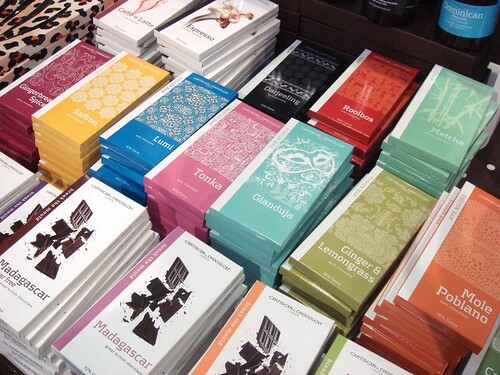 The ever reliable L'Artisan Du Chocolat showcased a beautiful array of designer chocolate flavours. 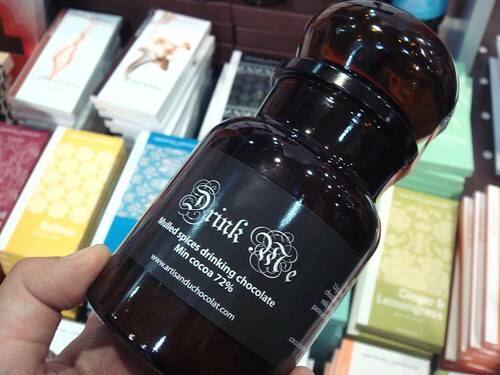 Lou knows her chocolate so she picked up a selection of dark from varying origins in various intensities. I'm a bit of wuss when it comes to cocoa content, so I stuck to wacky flavours like Rooibos and Matcha (well, I like the teas). 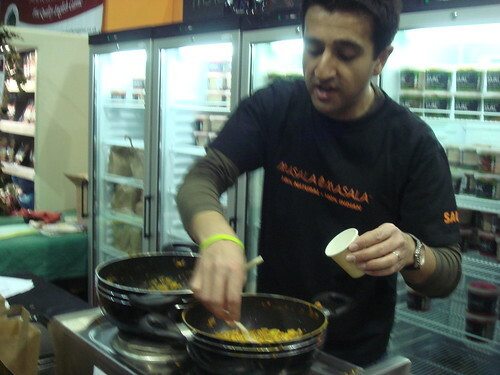 Masala Masala gave us some of the tastiest stir-in sauces I've ever tried. They had a pan of Daal and a pan of Shahi Paneer ready for tasting and both were deeply-flavoured without tasting of raw or burnt spices. I bought both those two, plus a pot of Karahi. 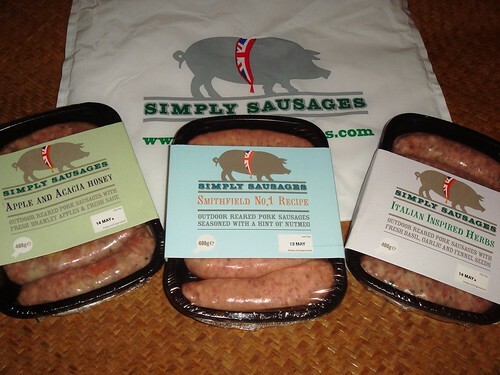 Simply Sausages had cooked up four of their finest flavours and were selling them for pennies. After chomping on all the flavours, I couldn't resist picking up packs of Smithfield No 1, Italian Herb, and Apple and Acacia Honey which came in a rather snazzy cooler bag. The best juice came from Waterperry Gardens - I snagged a bottle of Crispin which was wonderfully sweet and thirst-quenching. Laverstock Farm was probably the highlight of the show. We met Petal the Water Buffalo - a beast so chilled that she didn't even flinch when her owner happily chomped a buffalo burger whilst standing next to her. 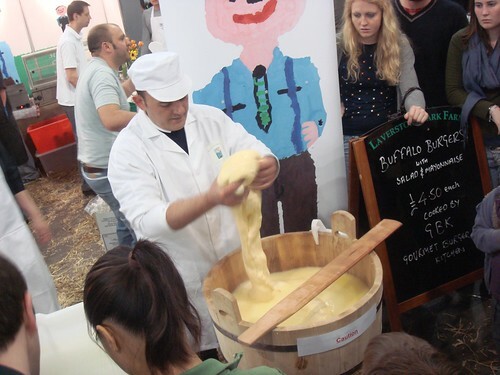 They also had a mozzarella stretching demo which reminded me of Turkish ice cream I'd seen in Japan. I came away with a bumper box of buffalo goodness. In fact, despite the smell, by far the nicest thing was the presence of beasties throughout. 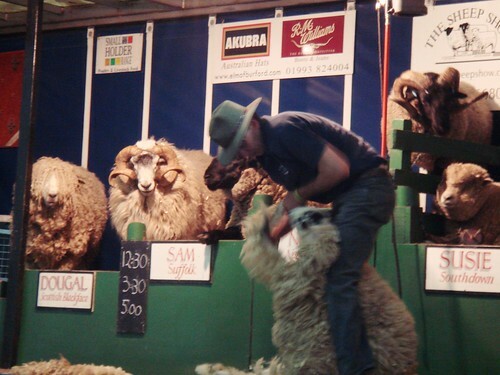 There was Petal and the Sheep Show of course, but there were also chickens and lambs and the scrawniest Jersey cows you've ever seen. The Chef's Theatre was a bun-fight as people clamoured to see their favourite chefs off TV. 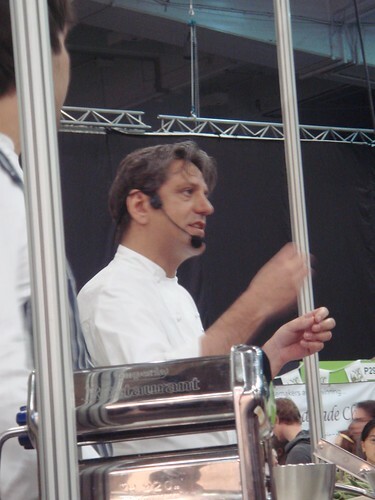 I did some guerilla style diving to bring you these slightly fuzzy pictures of Thomasina Miers (MasterChef 2005) and Giorgio Locatelli, who I'll always remember as the guy who gets carrots mixed up with onions. 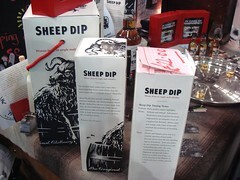 This year there seemed to be a glut of zany products eg Wallace and Gromit Bread Kits and Sheep Dip Whisky. 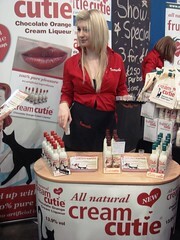 Cream Cuties featured on Dragons' Den was like a Bailey's Glide but also came in vanilla and strawberry flavours. 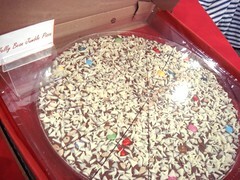 The Gourmet Chocolate Pizza Company was just plain weird, but I think Welsh Tapas beat them for oddity. 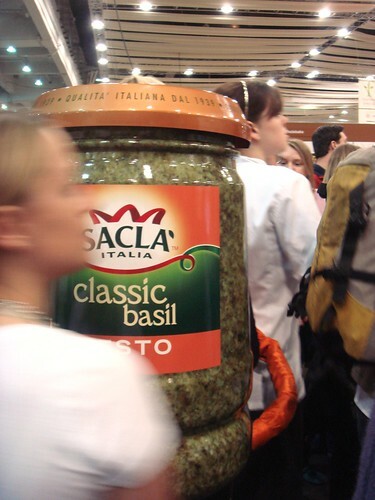 Even stranger were the Sacla Busters who went round squirting pesto on little bits of bruschetta to offer to unwary folks. 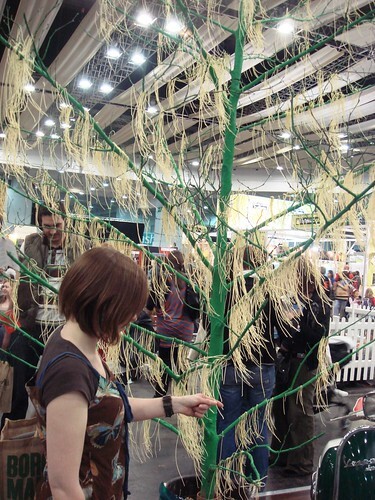 It almost made sense that they were based next to a Spaghetti Tree. Lots of producers and products had daft names mainly involving puns eg The Veggie Table and I'm still baffled by the company called Cheesecake Facts. The prize for the dumbest name ever has to go to Intolerable Food though. 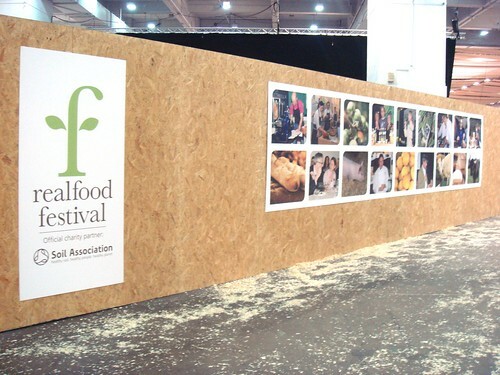 Their aims are laudable - to produce gluten and dairy free foods - but they sound like they provide the exact opposite. Their website says "What else could we call ourselves but the Intolerable Food Co?" 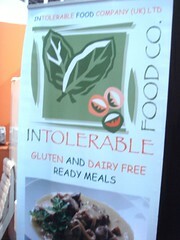 How about the Tolerable Food Co? 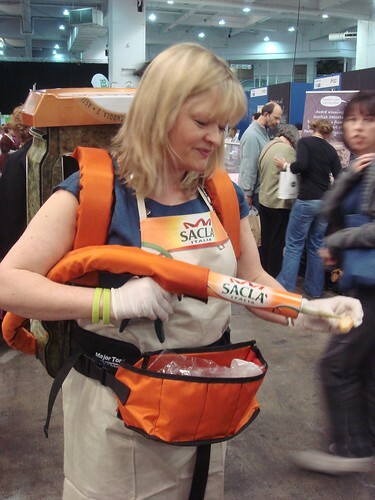 Anyway, at about 5 we left Earls Court, stuffed with samples and laden down like donkeys. 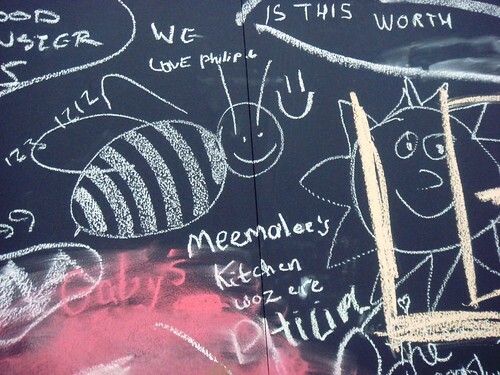 I'd flushed away about £150, so I obviously had a good time. It's just that it wasn't nearly as good as last year's. C - Must try harder. Fantastic post and agree with you completely on the bizaare mixing up of categories - I know the chocolatiers probably didn't want to be next to all the other chocolatiers (tougher competition? easier direct comparison?) or the tea producers next to other tea producers and so on. 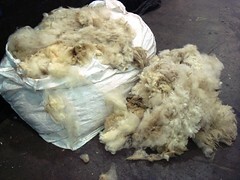 But the way they were organised made it difficult to find all the producers within a category of interest. With the cheeky charging for maps, this was even more of a problem. Oh and as for those cotton bags? I arrived at 10.20 am on the Friday and they weren't giving out any such bags when I entered! I don't know whether they weren't bothering for trade visitors or whether they just hadn't got themselves organised in time? Who knows? Anyway, looks like we both found enough good to outbalance the mediocre and the downright bad or weird! Nice post, I too felt the corporate slickitude, but hoped it was down to friday being trade day. I guess not. Damn those oyster people, glad you sorted them out! I was there just after 11am on Friday and didn't get the bag either. I agree with a lot of what you say too - funny, we went to almost completely different stalls and still had the same impression. I got the feeling some people were feeling the pinch (one stall which I'm not going to name was cutting their chocolate truffles into quarters for testing - never seen quite that level of parsimmony before at these things), others were incredibly generous with their time and samples - a pretty friendly bunch, I'd say. However, I'll be quite happy never to see another cupcake as long as I live. What is the point of them, I still don't get it. Lovely post - I didn't go last year so it's great to hear your comparison. I was lucky to get a bag when I went on Friday afternoon. Now I'll explore the rest of your fine blog! Wise words as always MiMi, and beautiful photos. Take it as a compliment that the organisers think so too!! (but defo worth a complimentary pair of tix for the cheek I'd say). I'll be interested to hear your views on the tea chocolate - I'm loving the Madagascan 70% one. 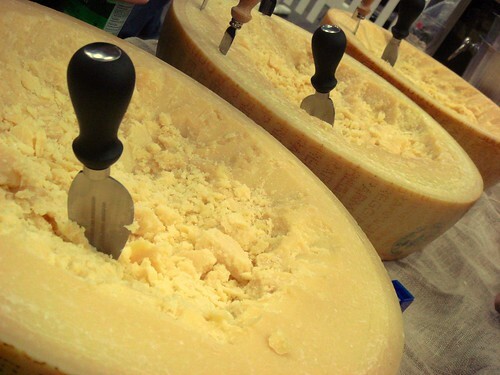 @Kavey - loved your post on the RFF! 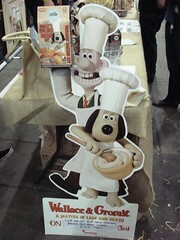 It's funny we didn't go to the same stalls - and I think neither of us overlapped with the Ginger Gourmand. I'm definitely going to go next year but I'll probably end up being rude about it again. @Suze - I've probably been blacklisted by Rossmore now. 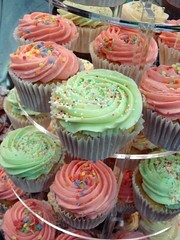 @Catherine - cupcakes everywhere and none of them on offer for a taste either! @Louise - haven't tried the chocolate yet. And even if I do complain about Taste, it won't have anything to do with you, heh! 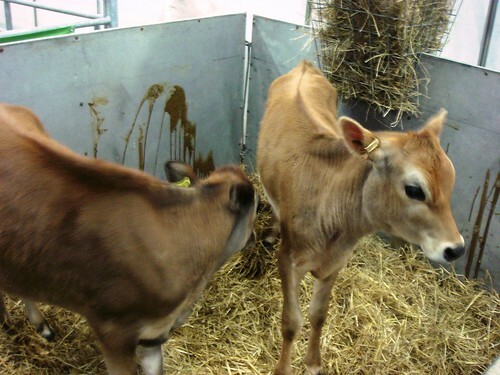 Well, with animals you generally tend to get poo - besides which, wasn't it more a farmyard smell? At least some bloggers can still write. My thanks for this piece of writing! Thats an all 'round great blog!!! Abnormally well executed piece of writing..